Peptic Ulcer Disease | Infonet Biovision Home. Peptic Ulcer Disease is a condition in which the stomach and small intestine lining are slowly eroded away. By an acid-resistant bacterial infection Helicobacter pylori bacteria (H.Pylori). The disease is caused by heavy use of aspirin and related medications, and disorders that causes excessive acid production in the stomach. Stress is also regarded as a predisposing factor, for ulcers. As the stomach lining deteriorates and loses its mucus layer protection, the acid erodes the stomach tissue. This specific chain of events results in gastric ulcer. Acid can also erode the tissue lining of the first part of the small intestine, the duodenum, and result in a duodenal ulcer. 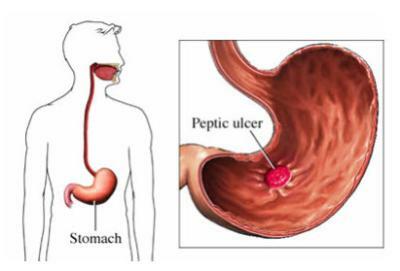 Peptic ulcer is the general term for both types of ulcers. Most ulcers in young people occur in the duodenum; in older people they occur primarily in the stomach. The typical symptom of ulcers is pain about 2 hours after eating. Digestive acids acting on a meal irritate the ulcer after most of the meal has moved to the jejunum area of the small intestine. The primary risk associated with an ulcer is the possibility that it will erode entirely through (perforate) the stomach or intestinal wall. The Gastro-intestinal contents could then spill into the body cavities causing a massive infection, called peritonitis. In addition an ulcer may erode a blood vessel, leading to massive blood loss (haemorrhage). For these reasons, it is important not to ignore the early warning signs of ulcer development. Infected persons have an increased lifetime risk of gastric adenocarcinoma (stomach cancer). 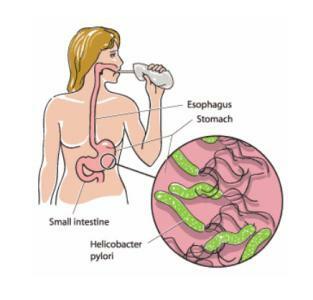 Accurate, inexpensive, and non-evasive tests are available to diagnose H.pylori infection. In the past, milk, and creamy therapy- the "sippy" diet- was used to help cure ulcers. Clinicians know now that milk and cream are two of the worst foods for an ulcer. The calcium in these foods stimulate stomach acid production and actually inhibit the healing of an ulcer. Restrict or avoid foods that may cause gastric irritation and excessive gastric acid secretion and help prevent uncomfortable side effects such as heartburn. Eat three small meals and three snacks evenly spaced throughout the day. It is important to avoid periods of hunger or overeating. Avoid eating within 3 hours before bedtime. Bedtime snacks can cause gastric acid secretion during the night. Cut down on caffeine-containing foods and beverages, citrus and tomato products, and chocolate if these foods cause discomfort. Include a good source of protein (milk, meat, egg, cheese, etc.) at each meal and snack. Antacids should be taken in the prescribed dose, One-hour before and 3 hours after meals and prior to bedtime. This regimen is most likely to keep the acidity of the stomach at the most stable and lowest level. Milk and cream feedings should not be used as antacid therapy. Although milk protein has an initial neutralizing effect on gastric acid, it is also a very potent stimulator. Hourly feedings of milk have been shown to produce a lower pH than three regular meals. There is little rationale for completely eliminating any foods from the diet unless a particular food causes you repeated discomfort. Identify foods that repeatedly cause discomfort or irritability of the stomach and eliminate them from your diet. Avoid consumption of carbonated drinks, especially with a straw. Eat nutritious meals on regular schedule, don't skip meals and include enough dietary fibre. Vander A et al. (2000). Human physiology: The mechanisms of body functions. 8th ed. Boston: McGraw-Hill.